2. Was the taurobolium associated with Mithras? the Tyrol. Colour is modern. 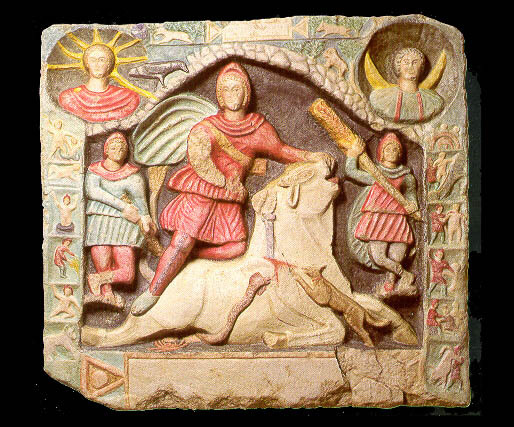 A feature of every Mithraeum was a depiction of Mithras, in the act of killing the bull. This is known as the tauroctony in modern literature.1 These vary in detail, as may be seen by looking at the gallery of images, but the main features may be seen very clearly in the coloured version of CIMRM 1400, right. Mithras (centre), kneeling on the bull, holding it by the nostrils with his left hand, stabbing it with his right hand, and looking towards us. The bull bleeds. A dog and a snake jump up to lick the blood. A scorpion grabs the bull's testicles. The bull's tail is a sheaf of corn. All this takes place in a cave, whose roof is above Mithras. Woodland scenes take place above the roof. Top left is the sun, Sol, with a crown of rays. A long ray streaks down to light on Mithras. A raven sits nearby. Top right is the moon, Luna. In some cases busts appear at all four corners, which represent the four winds. The taurobolium was an ancient ritual associated with the cult of Cybele in all but five of the inscriptions that record it. In its latest form, recorded by Prudentius, it involved standing in a pit under a metal grill, on which a bull was killed, thereby experiencing a shower of blood. 1 Roger Beck, "The Religion of the Mithras Cult in the Roman Empire: Mysteries of the Unconquered Sun", Oxford University Press, 2006, p.17 and n.3: "The term is modern". 2 Gordon, Richard, "The date and significance of CIMRM 593 (British Museum, Townley Collection)", Journal of Mithraic Studies 2 (2), 1978, p. 148-174. Online here. p.156: "If we may be reasonably confident that 593 is the earliest extant Roman version of Nithras as bull-slayer (and indeed the earliest such representation anywhere in the west)..."
3 Clauss, M., "The Roman cult of Mithras", p.22: "Alcimus was the slave-administrator of one Ti. Claudius Livianus, who is probably to be identified with the praetorian prefect under Trajan, so that the votive is to be dated to the first quarter of the second century AD. "; p.146: "A cult-image from Rome, in fact one of the earliest, datable to the first quarter of the second century A.D.(fig. 105), is dedicated, as the inscription tells us, to Sol Mithras (p. 22)." Wikipedia gives a date of 100 AD, and lists a series of references; but Clauss (2000) does not say so, as the Wikipedia reference claims, nor does Beck (1998), so the claim is probably a hoax. 4 M. Clauss, The Roman cult of Mithras, p.98-9. 5 See Vermaseren's description of CIMRM 1400 for more details. 6 Robert Duthoy, The Taurobolium: its evolution and terminology, Leiden: Brill, 1969. 7 Duthoy, p.126: "The inscriptions show us that in each of the three phases the taurobolium formed part of the cult of Cybele, although the oldest documents indicate that this was not always so. It seems likely that the taurobolium was taken up into the metroac cult during the reign of Antoninus Pius." And p.27: "However the wide-spread desire for purity in the third century seems sufficient to explain the change to the second phase, and the fierce competition between paganism and Christianity is the obvious reason for the developments characteristic of the third phase." 8 CIL VI, 736. It is not included by Vermaseren in the CIMRM. 9 J. Lebegue, "Le bas-relief Mithraique de Pesaro", Revue archéologique, 3rd series, t. 13, pp. 64-69, 1889. English translation of most of it here. 10 Roger Beck, "Mithraism since Franz Cumont", in: Aufstieg und Niedergang der römischen Welt, II.17, 4, Berlin: Walter de Gruyter, 1984, pp. 2002-2115. p.2026: "There is no evidence that the Mithraists as such ever performed that rite, and a priori considerations suggest that a mithraeum – any mithraeum – would be a most impractical place to attempt it." 11 Franz Cumont, The Mysteries of Mithra, Eng. tr. 1903, p.178-183. 12 F. Cumont, Textes et Monuments vol 1, p.334, n.5: "Quoique l'opinion contraire soit très répandue, il est certain que le taurobole n'a jamais fait partie de la liturgie mithriaque..."